Day 2.1 of our Japan feeding frenzy. A tearful return to Choco Cro plus lunch with the salarymen. And fish waffles. I snap a quick pic to remember that wonderful moment of stepping out of the hotel on the first day of an overseas trip, in a city begging to be explored. We are like overexcited kiddies on a school excursion, except with hangovers. Note the bikes everywhere, cycling is a major form of transport in Japan. You'll see everybody on bikes: schoolkiddies, businessmen, 90 year old ladies, hipsters and folks on lovey dovey dates. Osaka is as flat as pancake so it's a great place to ride, but today we are out to walk. Like most cities we have seen in Japan, Osaka is a concrete beast, with pockets of beauty everywhere. For our first breakfast we have an old favourite: Choco Cro. Choco Cro is a chain of coffee\bakery joints that does good cheap coffee and wee pastries. It was a saviour on our first Japan trip when the dollar was down and the funds low. A coffee and small greasy pastry or two makes a mean hangover breakfast.The ice coffee is miraculously unsweetened, a rarity in Asia where sugar is added to sugar for taste. A latte and a googie egg pastry for only 390 yen, about $5. Not a bad deal. We've tried most of the coffee chains and Choco Cro is always a fave. The only downside is that Choco Cro stores can be hard to find. We stumble across these firemen doing a drill outside the Umeda Sky Building. It's too weird to describe so we put a small video on youtube, if you're curious. 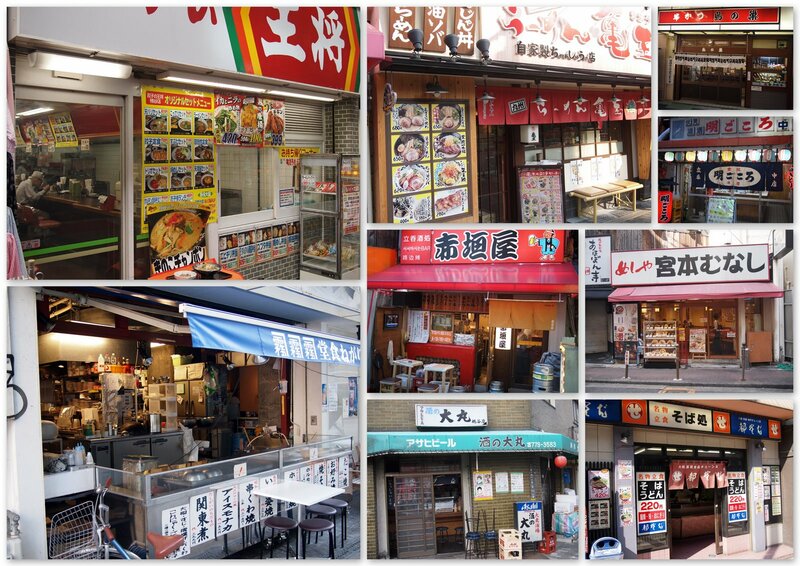 Random restaurant shopfronts. So much food, so little time, click to enlarge. Every time we turned a corner there was yet another little noodle bar, don bowl, grill or fish place. 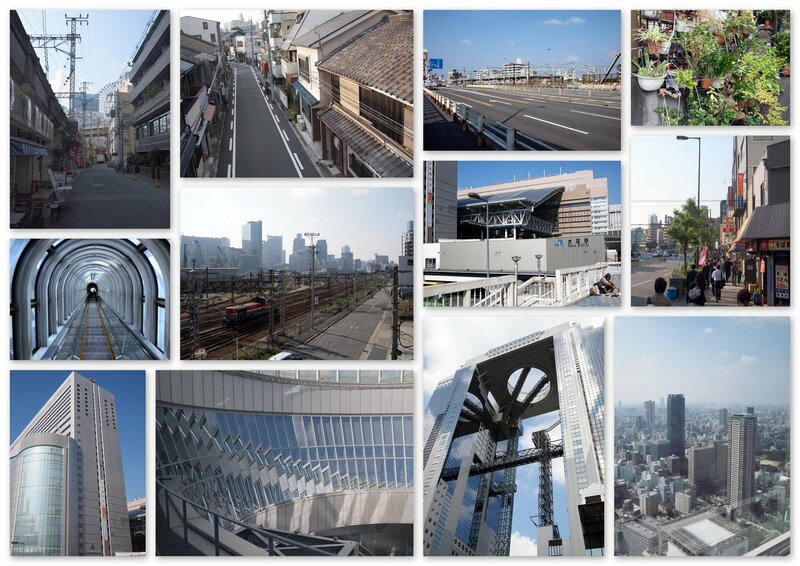 We catch a train to the boondocks of Tennoji with the aim of walking back a few kilometers to home. 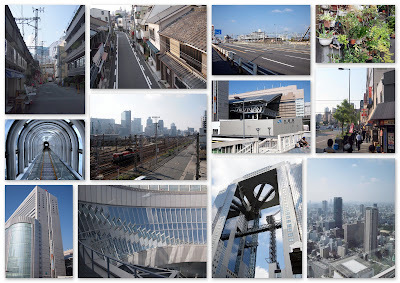 With no map and no sense of direction we got completely lost, but we did get to check out Osaka's finest light industrial areas and residential suburbs. For lunch we choose a random restaurant outside Tennoji train station. It's a business lunch kinda place. Some salary men came in a wolfed down a bowl of kare ramen faster than we drank our beers. We're on holidays, why not have a beer with lunch. It suddenly dawns on us that beer on tap is everywhere here. And it's sooo goood. We have a hunch that the breweries must maintain the equipment and replace the lines regularly, the beer was always so fresh and clean in every place we went to. There's no English spoken so the wait lady takes us outside to point at our selections from the plastic displays outside. Udon with beef. About $4. Ramen with pork. So simple and satisfying. About $4. Help yourself to side dishes. A couple came in after us and got a selection of these and some rice, a feast of different flavours for not a lot of yen. The dishes in the cabinets are often heated up on request, especially the fish (usually a mackerel in a sweet soy and mirin sauce). We wander for some hours. Miss Chicken leaves me in the husband tie-up area while she hunts for crap, I mean quality goods, in a hundred yen shop, the Japanese equivalent of a $2 shop. I happily sit outside watching the world go by. As we leave we discover this guy selling fish shaped sweeties, gotta try that. These are waffle fishies, not fishy waffles. Hot and crunchy and oozing caramel goo. It tastes divine and provides us with enough calories to help us get thoroughly lost. Ha ha - Husband Tie-Up area! Dave is all too familiar with those. Your photos are great - I love have you've managed to show so many. $4 ramen...noice! Definitely a weird clip...what were they doing? They seem to be practising some sort of fire drill. It was so strange and ritualised and noisy! Definitely have to try and find them fish thing when I go!! Love love love all ur photos!